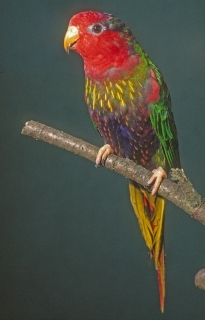 The calls of the Fairy Lorikeet vary geographically. Western populations produce a nasal sound, eastern birds are sweeter and more staccato. C.p. pulchella: Male-dark green back, wings and upper tail coverts; blue rump; purple/black spot on hindcrown; breast and occasionally lower flanks streaked with yellow; thighs purple/black; uppertail green tipped with yellow, with central feathers red towards middle and tips. Bill orange/red. Eye yellow/orange. Female-lower back green/yellow on sides; sides of rump to flanks yellow. C.p. rothschildi: Male-green breast streaked with yellow; black spot on hindcrown reaching forward to area behind eye and continuing as black wash on hindneck to meet green mantle; purple/black on abdomen; upper tail coverts suffused with yellow. Female-wide green chest band with yellow streaking; green/yellow spot on side of rump. C.p. pulchella: Green crown and nape; breast washed green with yellow streaking absent or minimal; green rump; thighs dark green washed with black; underwing stripe dull yellow. Bill dark brown. Eye brown. C.p. rothschildi: Dull green breast with yellow streaking absent or minimal. Call notes vary from area to area; in west sounds are nasal, in the east sweeter and shorter. Enclosure with well-drained floor, suspended over a concrete base, or indoor cage 1.2m (4 ft) long in room with tile on walls and floor. Nectar, either a commercial mix specially formulated for small species, or a mixture of baby cereal (lactose-free), honey and malt extract or molasses, mixed with water (filtered or bottled), made fresh once or twice daily; fruits such as: apple, orange, cactus fruits, pears. Avoid protein as may cause reaction. Provide bird-safe flowering branches (unsprayed); also provide shallow dish for daily bathing. Use climbing toys such as ropes and swings. 5" x 5" x 10" (12.7cm x 12.7cm x 25.4cm) vertical box. The species is reported to be abundant in some areas but scarce in others because of trade. C.p. pulchella: Mountains of New Guinea, excluding Cyclops Mountains. C.p. rothschildi: Cyclops Mountains and northern slopes of mountains above Idenbreg River, Irian Jaya. Found in montane forest, forest edge and secondary growth from 750-2300m (2460-7544 ft). Found in pairs, or flocks of 15 or more individuals. Groups with other Charmosyna lorikeets in the tops of flowering trees.